The situation for Christians in the Middle East is the worst “since the Mongol invasions of the 13th century,” the Archbishop of Canterbury warned. Meanwhile, the U.S. House of Representatives last week passed the “Iraq and Syria Genocide Relief and Accountability Act”, which seeks to assist with the rebuilding of the Christian and Yazidi communities in Iraq and Syria. “Across the region Christian communities that were the foundation of the universal Church now face the threat of imminent extinction,” Archbishop Justin Welby wrote in a Dec. 2 article for The Telegraph. Welby noted that the Christian population of Iraq is under half what it was in 2003, and many churches had been destroyed. The Syrian Christian population has halved since 2010. In June, a Freedom of Information request found that, in 2017, just 11 of the 4,832 Syrians admitted to Britain under the government’s Vulnerable Persons Relocation Scheme (VPRS) were Christian. This was despite an estimated 10 percent of the Syrian population being Christian at the start of the country’s ongoing civil war. Christians in the Middle East “face daily the threat of violence, murder, intimidation, prejudice and poverty,” Welby wrote. The U.S. House of Representatives has passed the “Iraq and Syria Genocide Relief and Accountability Act”. Having also passed the Senate, the bill now will go to President Donald Trump, who has indicated he is willing to sign it. The bill would provide funding to entities, including those who are faith-based, that are assisting with the humanitarian, stabilization, and recovery efforts in Iraq and Syria to religious and ethnic minorities in the area. It would also direct the Trump administration to “assess and address the humanitarian vulnerabilities, needs, and triggers that might force these survivors to flee” the area, as well as identify potential warning signs of violence against religious or ethnic minorities in Iraq and Syria. The Senate unanimously passed a slightly amended version of the bill Oct. 11. 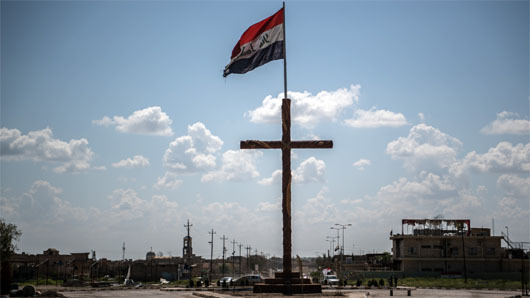 “The fact that this bill passed both the House and the Senate unanimously shows that the American response to genocide transcends partisanship and that there is enormous political will to protect and preserve religious minorities in the Middle East, including Christians and Yazidis, who were targeted for extinction,” said Knights of Columbus Supreme Knight Carl Anderson upon the bill’s passage. Anderson testified at a congressional hearing about the bill.